In this post I breakdown how I got this shot. I hope seeing what I do reveals something useful, or inspires you to ask me questions about taking this kind of photo. This image received an Honorable Mention in the 2016 International Photography Awards. 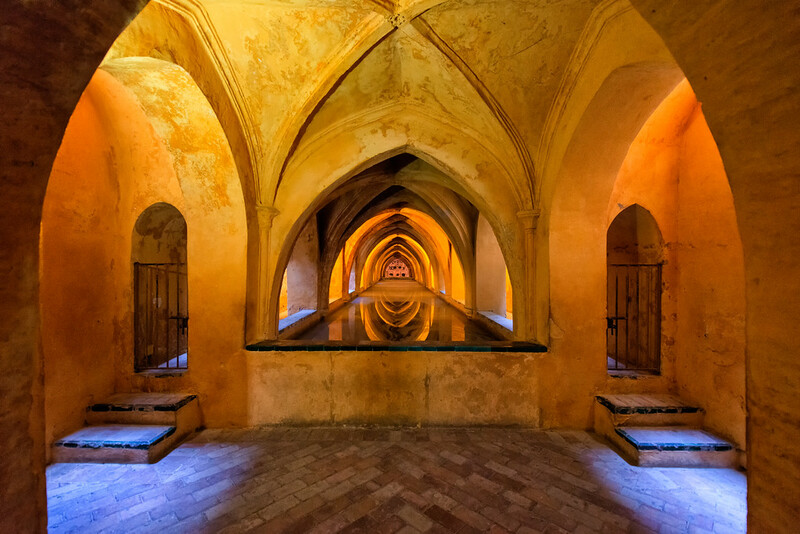 The photo was taken at the 14th century Moorish Palace, or Alcázar, in Seville Spain. Besides being a Unesco World Heritage site, and used by kings, the palace was in the movie Lawrence of Arabia and the gardens appear in the Game of Thrones TV show. Being curious and exploring is a big part of how I find interesting places. I spent a long day walking around the palace before I discovered the small doorway to the baths. The chamber was dark, and the shot was hand held because I wasn’t allowed to use a tripod in the palace. If I had a way to keep the camera steady I would have shot with a small aperture and low ISO to get the whole room in focus with minimal ISO noise. But to get enough light, I was forced to use a wide aperture and a high ISO. When I got home I did some noise reduction to compensate for the high ISO, which worked well since there wasn’t a lot of fine detail in the scene. I focused the camera on a spot a couple feet in to bath to make sure the gates and foreground were in focus, because that’s what people will notice the most. Focusing a bit in to the scene also kept the background from going too far out of focus. The fact that the background was mostly shapes, without a lot of detail, helped to conceal the lack of sharpness. It is indeed a beautiful shot. I understand it all except this: keep the sensor parallel to the walls. What does that mea? Hi, it means keeping the camera vertical, straight up and down. If it tilts forward or backward, something I do a lot if I want to include more roof or floor, then the lines in the image start to distort, like when you are looking up at a tall building. Ah yes. Got it. Thanks. It’s magnificent, Ronald. Gongratulations, it’s well deserved!